U.S. crude oil inventories fell 0.3% for the week ending March 15, according to an Energy Information Administration report (link opens a PDF) released today. The 1.3 million-barrel drop wasn't enough to affect crude oil inventories' overall levels, which remain "well above the upper limit of the average range for this time of year." After last week's report recorded crude oil refineries' lowest output in two years, this week's solid 2.5 percentage point gain to 83.5% comes as a relief to the energy economy. Gasoline inventories fell 1.5 million barrels to 222.8 million barrels overall, pushed down by finished gasoline inventories but slightly up by blending components inventories. Prices at the pump fell just over 1 cent to $3.696 per gallon, a 4.9% increase over 2012's equivalent price tag. 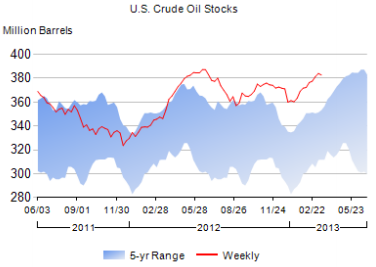 The article Crude Oil Inventories Fall 0.3% originally appeared on Fool.com.